Greg: And I’m Greg Slater with Nest Realty (434-981-6655). We wanted to take this opportunity to talk to you a little bit about the Crozet Market. When we talk about the Crozet Market, we define it as the elementary school districts of Brownsville Elementary and Crozet Elementary. Sales are slowing, inventory is creeping up, new construction is moving along, and we’re seeing price moderations. Watch the whole video, skim the transcript; ask us questions. 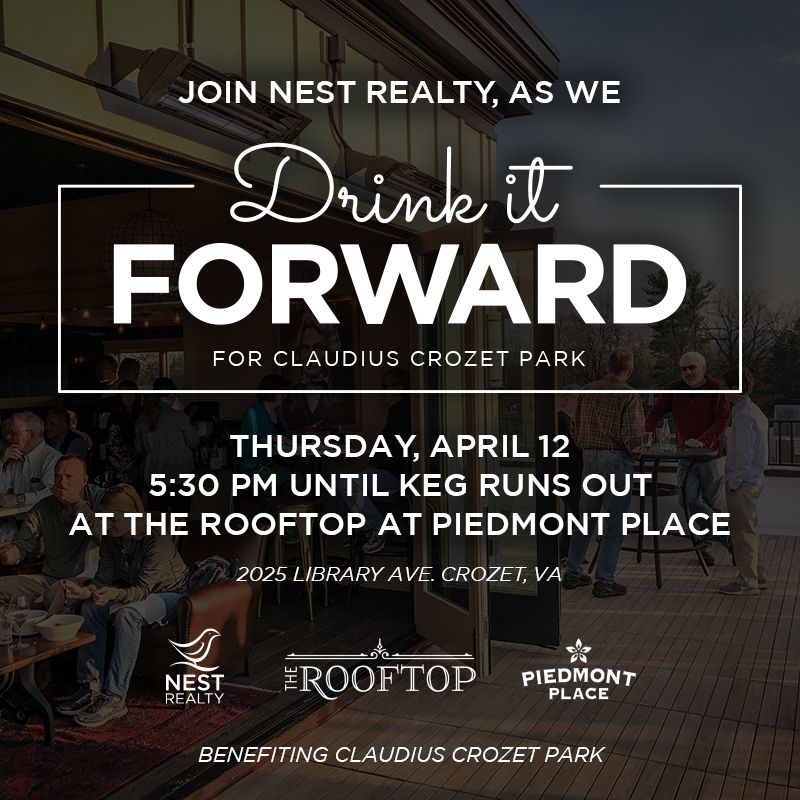 Jim: Hey there, I’m Jim Duncan with Nest Realty here in Crozet. Greg: And I’m Greg Slater with Nest Realty. We define the Crozet market as the school districts of Brownsville Elementary and Crozet Elementary. We gave you some stats in our last video. We were talking about the fact that sales in Crozet were down about 10% at that point. Moving ahead, we’re looking a little bit past the third quarter to the end of October, year to date. We’re still going in the wrong direction. Now we’re about 16% off. It’s a real estate post; I’m real estate agent. One of the best additions to Nest’s site over the years is the Seller’s Scoop – where the seller tells their story. Pictures are worth 1,000 words, but a few authentic words are invaluable. I love the words of my clients. Living Here Has Been: We have loved that we have found this place in Wickham Pond in Crozet, VA. We had no idea how much we would fall in love with this place every. single. day. The mountains, the people, the energy! We love that we can go to D.C. or Richmond or just stay home. There is magic in these mountains!! View: We love our mountain view from the master bedroom. It faces toward the farm with rolling hills with the mountain as a back drop. You can literally see the weather move in as it approaches. Room: We love to watch the fire in the living room especially on a chilly night. Hike: We love to hike Sugar Hollow, Humpback and even Mint Springs. We just discovered the Ragged Mountain area where you can hike around the reservoir. The options are endless from the Monticello Trail to the Shenandoah National Park right in our backyard! Breakfast: A new local breakfast place just opened in downtown Crozet. Simple menu. Good food. We love to go to Charlottesville and eat at the Bluegrass Grill! YUM. Dinner: Sal’s Pizza in Crozet is our go to Pizza Shop! Restoration in Old Trail in a wonderful place to chill out and enjoy a beautiful view!! On the Downtown mall, we love to go to the Red Pump. Delicious farm to table. Pub/Winery: Fardowners….local fare and hometown feel right next to the Crozet Hardware store and Mudhouse Coffee Shop!!! Living Here Has Been: Community. We’ll miss it. Crozet parades, special events. Passing books from one person to the next in a long line stretching from the “old Crozet library” to the beautiful new building will be something we remember forever! View: Bathroom picture window. Most mornings I wake up, walk into the bathroom, and spend a second to take in the mountain view looking south from the house to Heards Mountain. Tree: The maple in our back yard. It’s beautiful in the spring and glorious in the fall. Best of all it’s far enough away from the house that I haven’t had to clean a gutter since moving in! Walk: Name one. From this location we can walk to our favorite downtown shops or restaurants, hit the Crozet trails to surrounding neighborhoods, walk the new track around Crozet Park, or simply stroll the Parkside neighborhood. Hike: Mint Springs Park – great mountain trails with great views. Once while in the park we may have even ventured off the beaten path and up Bucks Elbow Mountain to find the site of the 1959 plane crash. Lunch: Sandwich at Greenhouse or Crozet Pizza. Dinner: Fardowners – Sunday evening especially – $2.50 pints on VA brewed beers! Pub/Winery: Stinson Vineyards – unbelievable mountain views, great wine, and live music on Thursday evenings in the summer. 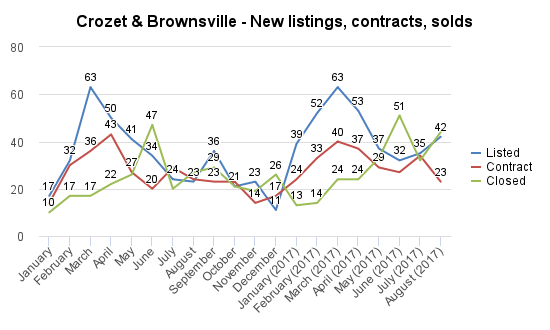 Questions/Curious about the Crozet Real Estate Market? If you are curious about the market, and googling isn’t doing it for you, come talk to two experts about the Crozet real estate market. Questions about the Crozet real estate market? Curious about the new construction or resale market? 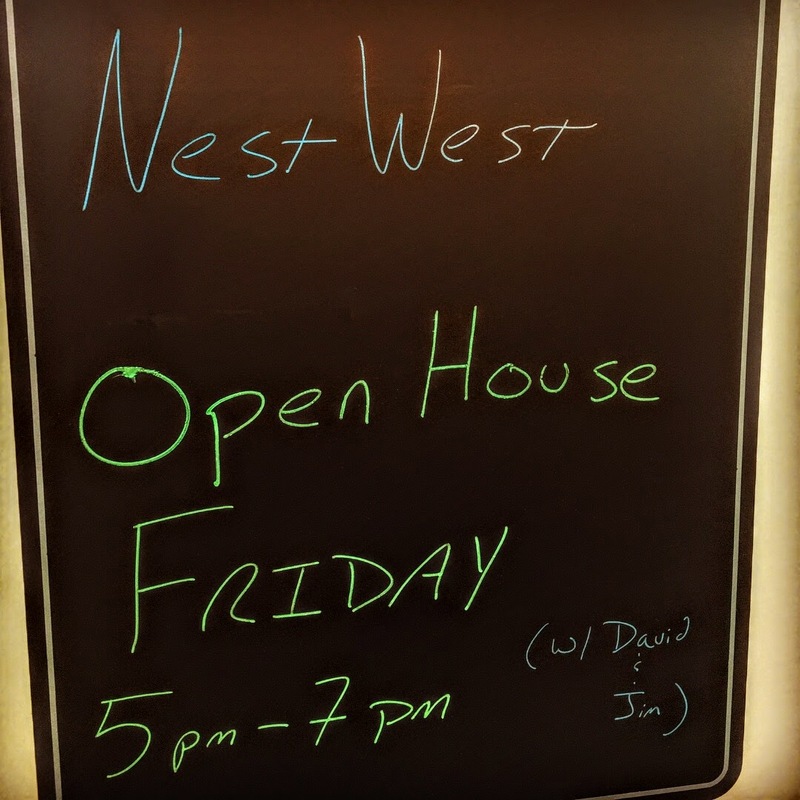 Stop by NestWest in Piedmont PlaceThursday from 5 to 7, grab a drink Blue Ridge Bottle Shop, a bite from Morsel Compass, dessert at Crozet Creamery, and chat with David & Jim! NestWest is right next to Over the Moon Bookstore & Artisan Gallery! Mark your calendars – 18 January from 5 to 7 at the Rooftop. Come talk about the Crozet real estate market with David & Jim. Read all of the real estate posts here on RealCrozetVA. Prices up, sales up, new construction is doing very well, and buyers & sellers need to get ready for the spring. 3rd Quarter 2017 Crozet Market notes; one of three pages. A lot of homes will come on the market in 2017 in Crozet, but how many will fit you? Q: When should a buyer or seller start the “I’m serious about buying or selling a home next year” conversation? 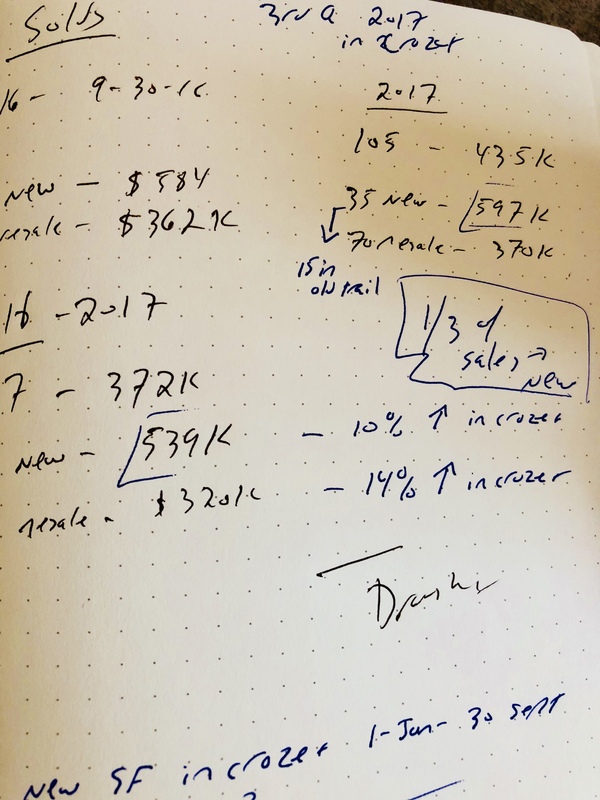 Some perspective on the Crozet market … if you are looking to purchase a resale home, best start targeting your micro market now. Schools matter; luckily, Crozet schools are pretty darn good, with great leaders in each. Short story – it may look like a lot of houses sell every year, but when you start drilling down, determining your locational and life triangles, there may be fewer homes that come on the market in Crozet than you might think (or want/hope). Disclosure: I’m a real estate agent. But you knew that, right?